Instead of my usual ramblings, I’ll try to actually give you something useful this time. Tonight, I present to you a full plate, but everything comes together quickly (I’d say in 45 minutes or less). I hadn’t really planned on sharing this but I realized that fish and veggies have been quite underrepresented in this blog and I make both frequently. 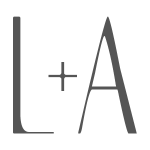 This will hopefully give you a more complete look at what I serve in my home. We usually have this meal once a week, the biggest variable being the choice of veggies. My favorite vegetable is the asparagus while my husband’s is the brussels sprout. To be honest, I didn’t use to understand this about him. When we met, I didn’t know how to cook so he tried to teach me how to prepare the foods he liked. Fortunately, my husband is no Master Chef (I mean this in the nicest way possible! :-)) so he taught me simply how to boil brussels sprouts and served them with mayonnaise. Unfortunately, this was (and still is) one of the least appetizing dishes I’ve ever tasted. You understand me, right? It wasn’t until I learned to roast this tiny relative of the cabbage that I began to enjoy it. In fact, I was lucky enough to get my hands on a freshly-picked stalk once and I couldn’t get over how sweet and delicious the brussels sprouts were. I became a convert, but I’ll still pass on the boiled kind. As for the rice, it’s simply stir-fried in garlic,soy sauce and olive oil. It’s the easiest, simplest fried rice to prepare but it’s one of the best ways to elevate a humble starch. In this instance, I had both brown rice and Haiga rice. The latter is a half-milled rice, so it’s not quite brown and it’s not quite white. Just like boiled brussels sprouts, plain steamed brown rice is not very appealing to me. I was raised on fragrant, long-grain white rice so it’s what I crave. Steamed brown rice, to me, is dry, boring and often overpowers the dish it’s served with. However, when it is stir-fried the way I described earlier, it becomes something else entirely. Medium-grain brown rice, my favorite, becomes nutty, light and loses its overpowering quality. It softens up with the addition of olive oil and soy sauce and becomes delicious with fragrant garlic. If you like rice this would be a good accompaniment for a variety of main courses. Now for the salmon, everyone is familiar with this fish, so I won’t discuss it too much here. I’ll share my favorite way to prepare it below. This brings us to the last component of this meal that you may not be too familiar with, the tomato dipping sauce. 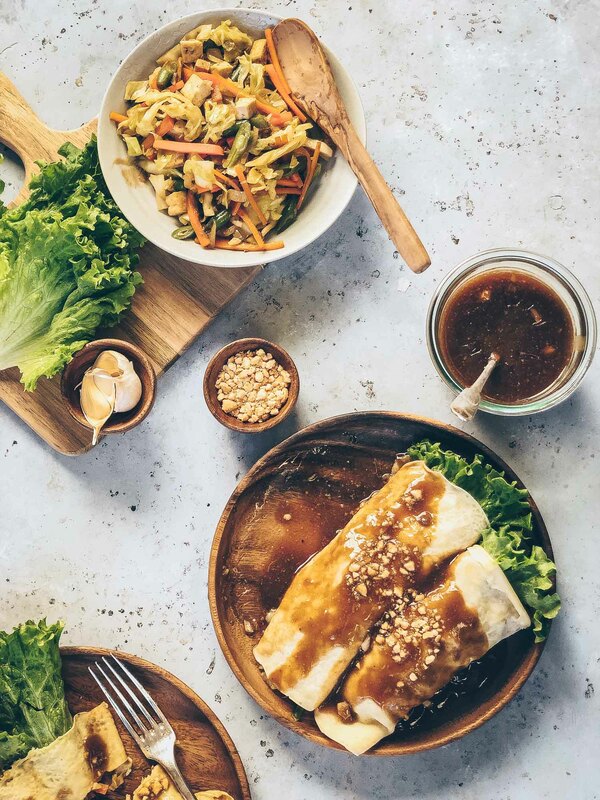 In Filipino culture, dipping sauces and condiments are commonplace. In fact, most filipinos will have a favorite sawsawan (literally translated: for dipping) to accompany a particular dish. This could be as simple as soy or fish sauce to accompany a stew or vegetable dish, vinegar with soy sauce and chopped garlic and onions for a roast meat, or a squeeze of kalamansi (the Philippine equivalent of a lemon) for a brothy soup. After ten years, even my non-Asian husband has grown to enjoy these sauces with a lot of his meals. To me, they complete a meal. For instance, this tomato and soy sauce mixture is so simple but it ties the fish and the rice together. It’s like a salsa, really. If you had a burrito without salsa, the tortilla, beans, rice and meat might be pretty dry. The salsa, like this dipping sauce, removes the “it’s lacking something” factor. Well I guess I still rambled–hard habit to break. If you’ve read this far down and you decide to try one or all of the above, please let me know how it turns out. If you also have a favorite condiment or dipping sauce, I’d love for you to share it. I would enjoy being introduced to something new. Preheat oven to 400º. Partially cook the brussels sprouts by boiling them in water or steaming. I usually boil mine for 5 minutes just to shorten the roasting time. After boiling, cut the larger sprouts in two and toss all in a sheet pan with the remaining ingredients. Roast for about 15 minutes until they are tender and some of the leaves are a deep brown. Set aside. Don’t turn the oven off. 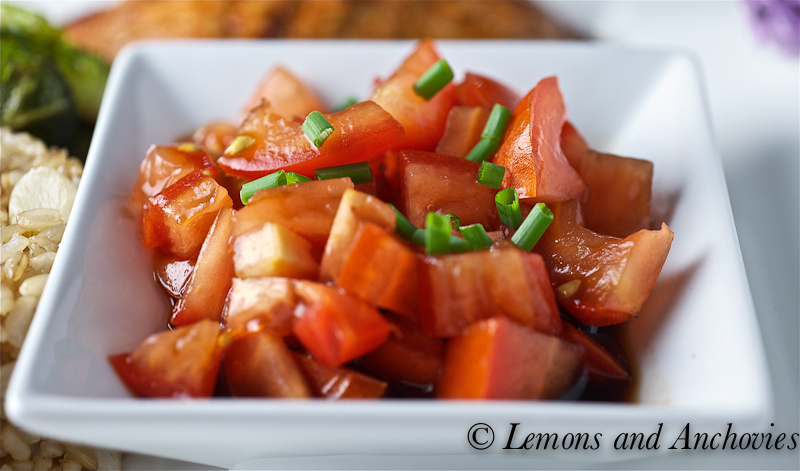 Toss tomatoes and soy sauce together and set aside. If you haven’t tried this before, I would recommend starting with about 1 or 2 teaspoons of soy sauce for every regular-sized tomato you use. This is all a matter of how salty you want it to be. Before you turn on the stove, you might consider prepping the salmon by rubbing in the ingredients below. You’ll want to turn up the oven to 475º while you fry the rice. Heat up a little olive oil in a pan. High heat works best for stir-frying rice but this also makes it very easy to burn the garlic. If you’re nervous about doing this, I would suggest adding the rice when the oil is hot and stir-frying for a couple of minutes before you add the garlic. When you feel more in control of the rice, create a well in the middle of the pan by sweeping the rice to the outside of the pan. Add a little more oil in the now exposed center of the pan and throw in the garlic. Just allow it to cook for a minute or two, stirring that little area to prevent burning. When you start smelling the garlic it’s time to incorporate it with the rice. When the rice is sufficiently heated through, add the soy sauce a little at a time (a couple of tablespoons is usually enough) and continue stir-frying for a minute. Turn off the heat and set aside. To prep the salmon, rinse and pat dry with a paper towel. Coat each piece with the rest of the ingredients. Don’t be too generous with the balsamic vinegar and soy sauce (if using) as this serves mainly to add color when broiling. I know that everyone has a preferred doneness for fish so just use my instructions as a guideline. I like a crisp outside with a slightly undercooked center–just cooked a tad more than a seared tuna would be. To accomplish this, I put my salmon in the oven for about 3 minutes (depending on the size of the fillets) then I turn on the broiler and let the top brown and cook for a minute or two. Plate everything together and serve. Just bumped into your blog and I liked it so much. This space is really nice with good recipe collections. Will surely visit again. Rach, thanks so much! 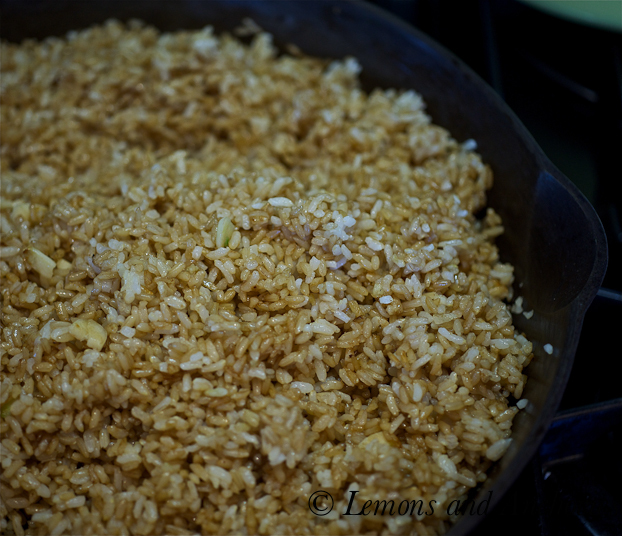 I peeked into your page and I’ve already found a recipe I’d like to try: Tamarind rice. Thanks! Looks beautiful! 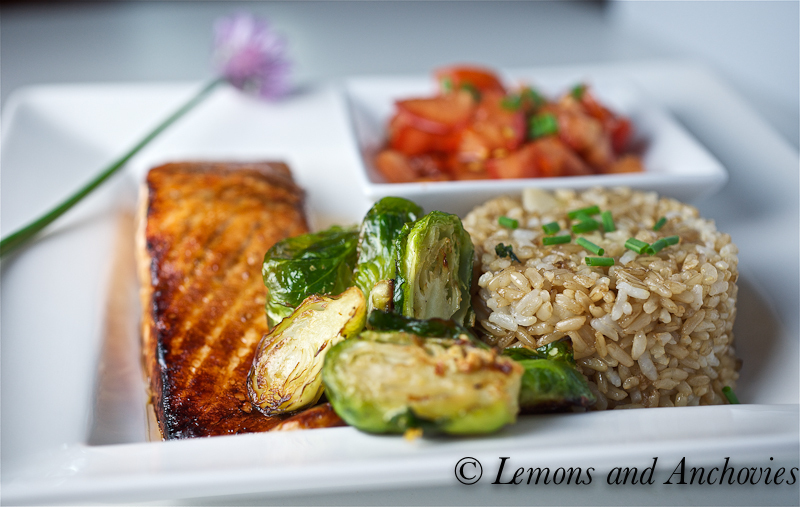 I adore brussel sprouts and salmon. Great touch on the tomato dipping sauce. This looks like such a wonderful meal! Thanks so much! What I like about it is that it’s guilt-free eating. That looks really good. I liked how you used brown rice. I am so used to regular jasmin rice when I make garlic rice. Will have to make this for my little one…looks almost like a bento box! It does, doesn’t it. Thanks! LOL! Boiled brussel sprouts with mayo! Sure doesn’t sound that appetizing… not like this gorgeous salmon – now that’s a great dish! My husband and I adore brussel sprouts. This meal would send us both to heaven. I can’t wait to give it a try. Thank you for sharing another beautiful recipe! wow another top 9! way to go! again congratulations on top 9! Malou, I couldn’t believe it. I was at another blogger’s sight and recognized my photo in the Top 9 banner. Crazy! What an authentic and very delicious meal you have put together! It sounds and looks delicious. 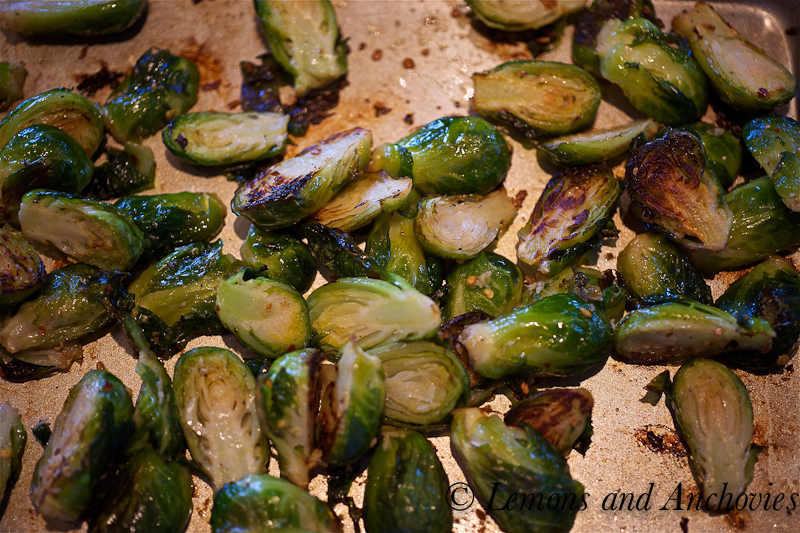 Roasting brussels really does give them a whole new flavor, doesn’t it? It’s probably my favorite way to cook them. 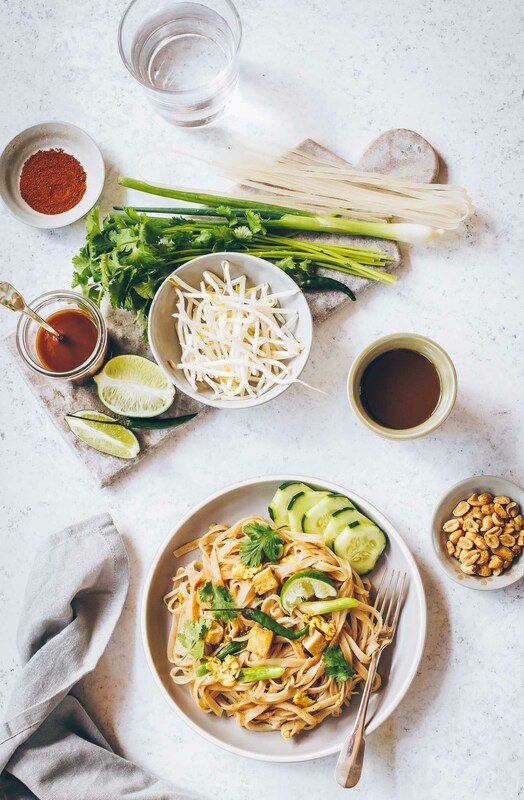 This looks like a great, well balanced plate — and something doable on a weeknight. Thanks so much, Stephanie. Roasting the brussels sprouts really makes them so much better. Thanks for enjoying this blog–it means a lot for a newbie like me! Oh, I love sawsawan – yours works perfectly with the salmon! Congratulations on another Top 9 – it’s beautiful! Liren, I’m filipina through and through when it comes to dipping sauces. I don’t think I eat anything without adding something to it. Thanks! That looks so clean and healthy plate. I was drooling the whole time when I read the recipe. The ingredients are so simple, Yet the picture looks so fancy. I am defiantly making this tonight. What a beautiful and mouth water dish. No wonder you can be one of Top 9 on foodbuzz. Very nice… and healthy too. Thanks for a great dinner combo! I like how this whole meal is presented and served. 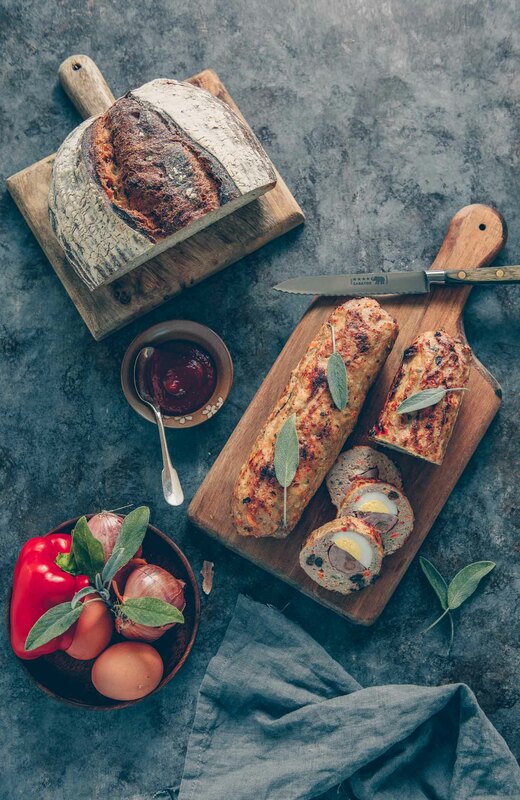 Deliciously healthy…healthily delicious….it works both ways. so happy this recipe led me to your blog. It’s lovely! And that garlic brown rice looks wonderful and exactly like something I would love to serve at home. Thank you! Hi, Mitzi. I’m happy to help! I usually prepare a 1-pound piece of salmon for me and my husband. But even for a smaller piece I would use one or two teaspoons of each and rub in on the entire surface of the salmon. You can’t really go wrong. You can rub them in separately or combine them in a small bowl and do it then. One suggestion to get more even browning on the salmon is to lay it on the baking sheet meat side down (so the skin side is up). This will allow for more even browning and the skin will crisp up a bit.